Dr. Lev Korovin’s way to becoming a dentist in Windsor was literary quite long. Close to six thousand miles, to be exact. He was born and raised in Russia in the family of dentists and medical doctors. So his choice of profession was quite clear from the early years – to continue the family tradition. Dr. Lev’s initial dental training was also obtained in Russia – he graduated from Moscow State University of Medicine and Dentistry and then practiced in his home country. But Dr. Lev did not stop there. 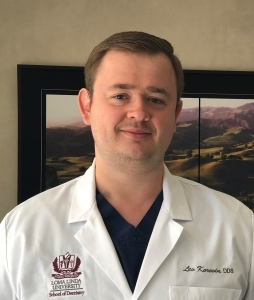 In 2017 he graduated from Loma Linda University School of Dentistry and became a licensed dentist in our beautiful state of California. Dr. Lev practices dentistry by the principle “treat others just as you want to be treated”. As such, his approach is straightforward – listen to the patient, evaluate general and dental health, and be open about options and complexity of patient’s problem. And he continues his learning. New technologies, new approaches, new treatment options… Dentistry as a field offers a lot for an inquisitive mind. Right now, Dr. Lev is focusing on digital technology that will offer our patients dental crowns in just one visit!